322 pages | 8 B/W Illus. In twenty-first century Japan there are numerous instances of media harassment, intimidation, censorship and self-censorship that undermine the freedom of the press and influence how the news is reported. Since Abe returned to power in 2012, the recrudescence of nationalism under his leadership has emboldened right-wing activists and organizations targeting liberal media outlets, journalists, peace museums and ethnic Korean residents in Japan. This ongoing culture war involves the media, school textbooks, constitutional revision, pacifism and security doctrine. PR, public diplomacy and manipulating opinion. 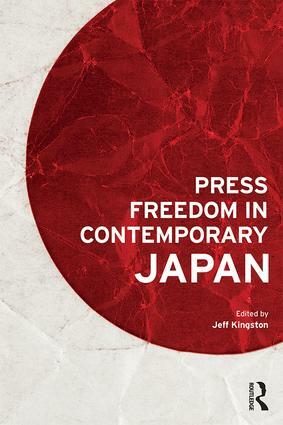 Press Freedom in Contemporary Japan brings together contributions from an international and interdisciplinary line-up of academics and journalists intimately familiar with the current climate, in order to discuss and evaluate these issues and explore potential future outcomes. It is essential reading for anyone wishing to understand contemporary Japan and the politics of freedom of expression and transparency in the Abe era. It will appeal to students, academics, Japan specialists, journalists, legal scholars, historians, political scientists, sociologists, and those engaged in human rights, media studies and Asian Studies. Jeff Kingston is Professor of History and Director of Asian Studies at Temple University, Japan. He is the author of Japan's Quiet Transformation (2004) and Contemporary Japan (2011).